Some of the more important health issues in the breed are presented here. Hip Dysplasia is an inherited deformity of the hip structure. The acetabulum is a depression in the pelvic bone into which the head of the femur rests, forming a ball-and-socket joint. Ligaments attach the bone structures to the muscle mass. Proper hip movement depends on these structures working together. Hip dysplasia is the condition in which either the acetabulum is too shallow to adequately hold the femoral head in place or the femoral head does not fit properly into the acetabulum. Varying degrees of severity may be seen from mild, asymptomatic dogs to severely dysplastic dogs with complete dislocation of the hip joint. The degree to which the dog exhibits symptoms is influenced by many factors such as the strength of the muscle and ligament attachments which help to hold the joint in place. Other factors include rapid growth and weight increase which stresses the joint. Studies have proven that dysplastic puppies whose diet is controlled to slow growth and weight gain may exhibit no outward appearance of disease and remain functional despite severe dysplasia. This approach allows the muscles and ligaments to develop enough to compensate for the bony failings. However, this does not alter the dogs genetic ability to pass on the defect to its offspring. The exact mode of inheritance has not been identified although it is certainly polygenic, or influenced by several genes and modifiers working in combination. Affected dogs bred to affected dogs produce dysplastic puppies with some consistency, and the more severely affected the parents are the more likely they are to produce affected offspring. However, unaffected dogs bred to unaffected dogs can also produce dysplasia. To avoid producing dysplastic dogs only those with above average hip conformation should be bred. Further, breeding should be withheld until evaluation has been done. There is no way to predict the soundness of the hip structure based on movement or palpation alone. Many dysplastic dogs have developed compensatory mechanisms that allow them to move well and remain active. Quality of movement does not accurately reflect the presence or absence of dysplasia. The x-ray has been proven to be the most accurate means of diagnosis. The Orthopedic Foundation for Animals was formed in 1966 and has been instrumental in diagnosing and controlling the disease in the United States. Originally dogs were x-rayed at 12 months of age, however the accuracy of diagnosis was significantly improved when, in 1974, OFA increased the minimum age to 24 months. A single x-ray of the hip is taken by a veterinarian and sent to the Orthopedic Foundation. Once there, the films are read by a panel of three Veterinary Radiologists who evaluated the laxity or looseness of both hip joints. Hips are then rated "Excellent" (superior hip conformation), "Good" (well formed hip conformation) or "Fair" (minor irregularities) as compared to other dogs of the same age and breed. Currently, OFA reports a 95% accuracy rate in diagnosing hip dysplasia. Many breeders will have preliminary x-rays evaluated on their potential breeding dogs before a great deal of time and effort is invested in showing and campaigning the dog. This is not required, but can save a lot of grief later if the dog is found to be dysplastic. Preliminary x-ray evaluations are performed by OFA between 12 and 24 months; the accuracy however varies from 100% accurate when rated Excellent, 98% when rated Good and 77% accurate for Fair ratings. 90% of dogs who are found to be dysplastic prior to 24 months will be dysplastic in later evaluations. One must remember however that final diagnosis of the disease cannot be made until the joint is fully formed at maturity. This is because hip dysplasia, while unarguably genetic in predisposition is also affected by such environmental factors as nutrition and level of activity. Other techniques have been developed over the years for identifying hip dysplasia in dogs in addition to the OFA method. The Laxity Distance Method was developed in 1977 to predict hip dysplasia in puppies 8-9 weeks old by palpating and manipulating the joint. To date, this method remains subject to the skills of the examiner and has a distressingly high rate of error when confirmed by radiography. Then Penn-Hip method of radiography and hip evaluation was developed by researchers at the University of Pennsylvania in 1983 and offered as a service in 1993. Currently, Penn-Hip evaluation is controlled by Symbiotics Corp. as the database and ability to manage the program outgrew the University's resources. Penn-Hip requires three x-rays with the hip in various positions. Each hips laxity or looseness is then measured mathematically. A "passing" measurement is based on the average for the breed. While more expensive, the advantages of the Penn-Hip evaluation are in it's objectivity and accuracy at ages as young as 16 weeks. Treatment options for dysplastic dogs varies based on the degree of dysplasia seen and severity of symptoms. Mild disease can often be managed with weight control, moderate exercise and drugs such as Rimadyl, Esogesic and/or chondroitin sulfate/glucosamine (Cosequin). If these therapies are unsuccessful your vet may suggest surgery to remove the femoral head (excision arthroplasty). Other surgical options include pelvic rotation to move the hip socket outward to provide more coverage for the head of the femur, or total hip replacement. Most dogs may lead a normal and moderately active life with these improved therapies and treatments. Hip dysplasia incidence can be controlled. Reputable breeders should always have breeding dogs evaluated and puppy buyers should insist upon seeing the paperwork. By carefully screening out affected dogs from breeding, we can eliminate this heritable disease in the North American Miniature Australian Shepherd. Note: Statistics From The Orthopedic Foundation for Animals 1999 These are the combined figures for dogs evaluated as North American Miniature Australian Shepherds and Miniature Australian Shepherds. © 2000, Janet Boursier. No portion of this material may be reproduced or used by any individual or organization without the express written consent of the owner. The eyes are the windows to the world. There has been some debate as to exactly what a dog sees, whether in color or black and white, and the shades and shadows he perceives. The structure of the eye of the dog is significantly different than that of humans. The dogs eye contains more cones which perceive light in grays, than it does rods which perceives colors. This allows the dog to see better at night; instead of the black that we see, things appear in more shades of gray making objects more distinguishable. The position of the eyes in the head is that of most carnivores, or meat-eating animals. The are positioned well forward to allow for sharp attention to prey. This forward position however, limits their peripheral vision so that they must shift their eyes or turn their head to see around them. Eyelids: The eye is positioned within the folds of the eyelids which offer protection to the globe. Dogs also have a third eyelid (the haw) which is not often seen unless the dog is ill.
Conjunctiva: The conjunctiva is a membrane containing many small blood vessels that lines the inner surface of the eyelids, both sides of the third eyelid and the white surface of the eye. Lacrimal gland: Lies between the lower eyelid and the third eyelid and provides approximately 35% of the eyes tears. Another lacrimal gland in the upper eyelid secretes the remainder. Tunics: The globe of the eye is comprised of three tunics. The tough outer fibrous tunic gives the eyeball its shape and contains the sclera and cornea. The Vascular Tunic contains the iris, ciliary body and choroid. The innermost Nervous Tunic is also known as the retina. Anterior and Posterior Chambers: Are filled with a liquid aqueous humor. Vitreous Chamber: Filled with a gel-like substance called vitreous humor. Lens: A transparent structure that focuses the light images onto the retina. Responsible for sharpness and clarity of vision. Ciliary Bodies: Circular muscles responsible for altering the shape of the lens to assist in focusing. Cornea: Circular transparent outer coat of the eye. Iris: The muscular colored portion of the eye that controls the opening and closing of the pupil. Pupil: The pupil appears black but is in fact the opening in the center of the iris that allows light into the back of the eye. Retina: The retina contains the light receptors known as rods and cones which convert the light passing through the pupil into nerve impulses. Optic Nerve: This nerve is an extension of brain tissue that transmits retinal nerve impulses to the brain for interpretation. Corneal Dystrophy: A condition in which grayish or silver opacities develop around the center of the cornea. The opacities are almost always symmetrical in each eye. This is a painless condition that does not progress to blindness. Some types of Corneal Dystrophy have been associated with Collie Eye Anomaly, though not all. The mode of inheritance is unknown, therefore affected dogs should not be bred. Generally it is acceptable to continue to include parents and unaffected littermates in breeding programs unless a pattern of the disorder continually appears in the line. Distichiasis: In this condition of the eyelid, one or several eyelashes may be found growing on the lower eyelid, which is typically without lashes. Trichiasis is a similar condition referring to lashes growing in an abnormal direction. This is a hereditary defect that can cause chronic corneal irritation through constant contact of the lash with the cornea. The only treatment is removal of the errant hairs through surgical excision or a local freezing procedure known as cryosurgery. Distichiasis and Trichiasis are thought to be a dominantly inherited condition but large scale studies are lacking. Ectopic Cilia: These errant eyelashes were first reported in the 1970's and defines lashes found growing on the inside or outside of the eyelid. Occasionally ectopic cilia has been reported growing from the conjunctiva itself. This condition produces constant severe corneal irritation, pain, squinting and tearing. Treatment and mode of inheritance is the same as that for Distichiasis. Glaucoma: This condition results from inability of aqueous humor, which is constantly being produced, to exit from the eye. This causes a buildup of pressure within the eye which can lead to blindness. The affected eye appears to bulge while the cornea appears hazy. Most often glaucoma is seen as symptoms of some other condition and is rarely a primary disease. There is, however, some evidence of a familial tendency for primary glaucoma and it is best to assume a genetic mode of inheritance until proven otherwise. Temporary treatment can be obtained through draining of the excess the fluid. Unless the underlying condition is sought and treated reoccurrence is likely. Retinal Dysplasia: This term is used to describe a condition in which the retina develops abnormally at birth and may become detached at birth or shortly afterwards, leading to total blindness. Cases of retinal dysplasia (also sometimes called retinal detachment) have been reported rarely in Australian Shepherds. It is commonly thought to be an autosomal recessive defect, in which both parents are carriers of the recessive gene. Because of the severity of the effects of the disorder which has also been associated with mental retardation, parents and siblings of affected pups should be removed from breeding programs. Notice that a large piece of iris on the right side of the pupil is missing. This incomplete development of the iris is called iris hypoplasia. A coloboma is also visible at about the 1 o'clock position in the iris. Iris Coloboma: This is probably the most common eye defect found in Miniature Australian Shepherds. Iris Coloboma is a condition in which the iris is incompletely formed leaving a "hole" in the iris that permits light to enter through. IC's may vary in size from undetectable except by ophthalmologic exam to large and easily seen with the naked eye. Due to the increase in light transmission, most affected dogs will squint and have impaired vision in bright sunlight. Mode of inheritance is not understood but does appear to be familial. American College of Veterinary Ophthalmologists (ACVO) vets currently recommend that affected dogs not be bred, however it is acceptable to include parents and siblings of affected dogs in breeding programs. Collie Eye Anomaly: This disorder is extremely common in Rough and Smooth Coated Collies who are thought to be one of the many breeds the Australian Shepherd originated from. CEA is known to occur with a fair amount of frequency in the Australian Shepherd, and while there are few, if any reported cases in the North American Miniature Australian Shepherd, chances of this disorder appearing in the breed is high without the vigilance of breeders. CEA is an autosomal recessive disorder that results in the absence of the tapetum (reflective and colorful upper portion of the eyeball interior that aids in night vision and the broad area of heavy pigmentation in the lower half that protects the retina from overhead glare in daylight), absence of pigment in the lower retina and abnormal formation and distribution of blood vessels in the choroid. Severe cases may also involve retinal detachment and optic disk colobomas. CEA is considered a serious hereditary defect due to the ever increasing numbers of dogs affected and the potential for sudden and permanent blindness. Affected dogs should not be bred and parents and siblings should be carefully and selectively bred only to known non-carrier dogs. Microphthalmia: Microphthalmia is a condition of abnormally small eyes. 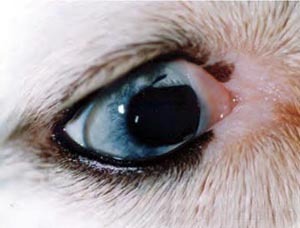 In Australian and North American Miniature Australian Shepherds microphthalmia is seen in merled dogs and represents an effect of the merle gene (the merle gene causes a change in gene expression in the eye). Affected dogs should not be used for breeding. Persistent Pupillary Membrane: A pupillary membrane covers the anterior (forward facing) surface of the eye during fetal development. The membrane normally atrophies and disappears before birth. In PPM small strands of the membrane remain and those that are attached to the lens or to the cornea are known to cause cataracts or corneal opacities. If blindness due to cataract formation is imminent, the strands may be surgically removed. There are conflicting reports on the heritability of this disorder, but its presence in only certain breeds lends credence to that belief. Cataracts: A cataract is an opacity of the lens, usually white, and may be of varying sizes. Early developing cataracts (juvenile cataracts) are considered genetic while others are known to be caused by any number of metabolic disorders including diabetes mellitus. Cataracts can be successfully removed, however dogs with genetically acquired cataracts should not be used for breeding. Progressive Retinal Atrophy: Miniature Australian Shepherds may be affected by one of two forms, Centralized or Generalized. Both are hereditary disorders of the retina. Generalized PRA affects the photoreceptor area and initially only affects the dogs ability to see at night. Many owners report such signs as refusing to go out in the yard at night or staying close by a lighted doorway. As vision worsens the dog becomes "velcroed" to the owners side. Centralized PRA is a disorder of the deepest layer of the retina which causes a loss of central vision. Peripheral vision is often intact. There is no treatment or cure for PRA which eventually progresses to complete blindness. It is accepted that both forms of PRA are inherited by a simple recessive gene carried by each parent. This defect is generally detectable by six weeks of age. There is some debate on whether to continue breeding the sire or dam of affected puppies. If puppies are affected then both sire and dam must be carriers. Continuing to breed the parents ensures that more and more carriers of the disease are added to the gene pool. In the MAS, the incidence of PRA is very small. To avoid escalating this disorder to worrisome proportions, parents and littermates of affected dogs should not be bred. The alternative to culling from breeding all siblings and half siblings of an affected dog would be to perform test matings to an affected dog. If the breeder wishes to breed an outstanding sibling of an affected dog, he would mate the outstanding sibling to a dog known to have or carry the recessive gene for PRA. If no affected puppies were produced in the litters the dog is known to not be a carrier and could be safely included in breeding. If any puppies are affected then dog is known to be a carrier and should not continue to be bred. References:	Willis, M.B., Genetics of the Dog, 1989. Siegal, M., editor, U.C. Davis, Book of Dogs, 1995.